How do videogames conceptualize leadership? Rhetoricians talk about processes partly because the field deals with communication at a high level of complexity. Even simple phrases have complex webs of interactions: “Yes, we can” worked because of the cultural memory of Si, se puede, because of the call and response practices of Black churches and African culture, because of the affirmation of “yes,” the Christian American ideals of hope, the bandwagon effect of “we,” the imagery of American perseverance that surrounded it, American cultural norms that make “thinking positively” a preferred value, the ambiguous predicate of the sentence/ proposition, its repetition in a Will.i.am video, et cetera. We talk about things at the level of processes because breaking them down further is kind of like defining an ocean as a collection of H2O molecules. Similarly, leadership is about processes. Actually, there’s more similarity than that: Leadership is surprisingly closely related to rhetoric. Pardon my academese a moment more. Northhouse (2001) defined leadership as “a process whereby an individual influences a group of individuals to achieve a common goal” (p. 3, quoted in Harris, 2002, p. 376). This is nearly identical to several definitions rhetoricians use for “persuasion.” Leadership happens on a macro-level as well: Leaders create organizational and corporate cultures, and these cultures provide people with meaning (Albrecht, 1994, p. 22, cited in Harris, 2002, p. 377). “Getting people to commit to common values and objectives within an organization is the foundation of corporate culture” (Drucker, 1998, cited in Harris, 2002, p. 377). This same creation of culture happens in constitutive rhetoric, and the meaning encoded in corporate, bureaucratic culture may well be synonymous with Bogost’s (2007) procedural rhetoric—the “practice of using process persuasively” (p. 28). Within these definitions, videogames are leaders just as much as they are persuasive or meaningful. Videogames have systems and processes that lead players to achieve common goals. How do videogames represent leadership? Videogames have a wealth of depictions of leaders and leadership skills. These depictions can be accidental—through stories crafted in or for America and Japan, in whose societies leadership is a revered soft skill, even a virtue—or intentional—through player-characters with bands of tag-alongs and followers, like Shepherd and his sheep. Sometimes, videogames beg the question that there is a line between leadership and management—“the process of getting work done through others” (Harris, 2002, p. 379)—in games like the SimCity series and Dust (Ubisoft, 2011). These depictions of leadership are educational. We can learn leadership through games mimetically—by watching and imitating them—although I’m not sure we should. Shepherd in Mass Effect 2 (Bioware, 2010) is an excellent example of a leader of a project work team. The team works best when Shepherd listens to the team members since “listening is often the most important skill” for leaders (Ray, 1999, cited in Harris, 2002, p. 284). “Listening helps in discovering emerging problems, dealing with hostile employees, managing interpersonal conflicts, enhancing employee morale, and it adds to the manager’s professional image” (Morgan & Baker, 1985, cited in Harris, 2002, p. 284). For Shepherd, listening helps in discovering side quests, (accidentally?) sexually harassing team members, managing whether Samara or Morinth is on the team, completing loyalty missions, and adding to Shepherd’s experience points. Moreover, N7’s corporate culture always builds project work teams: Shepherd’s team members are “from one or more functional areas,” “[selected] based on background and expertise,” working together to “solve a specific problem … and then disband,” assigned by management, and included in periodic “problem-solving sessions” (missions) (Harris, 2002, p. 359). Sometimes, this mimetic education is better than others. It’s nice to see people learn how to develop and work within a project work team, especially when that project work team sets off biotic combinations; however, the corporate culture of N7 that allows doggedly pursuing conversations with your employees and ultimately sexually harassing one or more of them is disgusting. As players, videogames show us parts of leadership that we struggle to see in our own lives. It’s easy to say a good leader seeks feedback from others and is introspective of one’s self, but actually knowing thy self and perceiving others’ feelings is very difficult. But, it really gets at the separation between two interlocutors in the interpersonal relationships that leadership operates on. 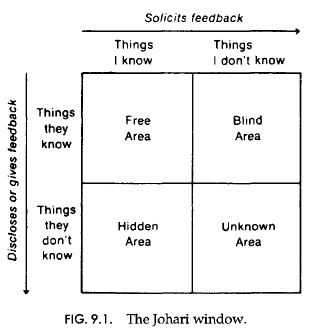 In videogames, the Johari window can be transparent while real, in situ leaders struggle to know their hidden—what a team doesn’t know about the leader—and blind areas—what a leader doesn’t know about the team. How can videogames teach leadership? Although I am skeptical of games (particularly videogames) as models of leadership, I have learned a great deal about leadership from them. Games taught me about corporate culture at an early age and how to run an interesting English class. When I was 13, I was second in command of Clan Cloud Cobra, a competitive gaming unit on MSN Gaming Zone in Mechwarrior 3 (Zipper Interactive, 1999) back when MSN Gaming Zone had lobbies for retail games. If memory serves, it had more than 200 members, and two-thirds of them were active members. Trying to keep 100 people from spamming the all chat and organized into two-person teams for league drops is probably more authority than most 13 year-olds get to experience at that age. The interesting part of Clan Cloud Cobra was its corporate culture: Brand new players were actively recruited while experienced players typically had to spend weeks convincing someone to vouch for them. All new recruits had to play training sessions with me, where I taught them to lag shoot (firing ahead of the visual image of an enemy to hit where the enemy actually is at the other end of the internet) and to dodge homing missiles. This meant that new recruits learned the game from the unit, and from me specifically, which made it easier for me to manage them on league nights, and that new recruits were instilled with the unit’s friendly and encouraging culture. Ranks within the unit, then, were markers of how much someone could teach a new person, and everyone knew teaching was the corporate culture of the unit. Now, teaching is my profession. But, I still rely on skills games taught me. This past month, for example, I was teaching Cassirer’s (1944) definition of man to my first-year English composition class. For first-year students, a German philosopher’s thoughts on what makes humans special can seem remote and, worst of all, boring. So, I set to work planning a class session that would get my students to engage with the material and each other to make a remote topic seem present and a boring one seem interesting. My model for leading this class was not one of the dozens in pedagogies for English literature and rhetoric—it was from my experience as a Dungeons & Dragons dungeon master. I provided my students with enough of a vignette that they would go on a quest to teach themselves Cassirer. I told them, “You’re going to lead class today and teach each other Cassirer, but I have one marker. So you have to plan how you’re going to handle notes on the board, and to do this well, you have to make sure everyone, including those who didn’t read the assigned reading, understands Cassirer’s definition of man.” They had a goal, the start of a narrative arc, limitations or rules to spur their ingenuity, and a measure of success. The fetch quest was set: Take your Cassirer, put it on the board, be wary of those who didn’t read. But, I had also primed them to make a plan, which, assuming they were human, meant they’d perform Cassirer’s definition at least once. “Making a plan” was the room half-way through the dungeon where I could stash new characters to replace the characters that died along the way, metaphorically. If my students weren’t prepared at all to teach each other Cassirer, I would always have this initial planning phase to salvage the class from. I lead them without holding their hand. They enjoyed engaging with the material and each other, and they understood Cassirer better for having performed it. We did it together, with me as dungeon master and my students as player-characters. This post was written for Critical Distance’s Blogs of the Round Table October 2015 topic, Leadership. Albrecht, K. (1994). The northbound train: Finding the purpose, setting the direction, shaping the destiny of your organization. New York: AMACOM. Bioware. (2010, January 26). Mass Effect 2. Xbox 360: Electronic Arts. Cassirer, E. (1944). An essay on man: An introduction to a philosophy of human culture. New Haven, CT: Yale University Press. Drucker, P. F. (1998). Peter Drucker on the profession of management. Boston: Harvard Business School Press. Harris, T. E. (2002). Applied organizational communication: Principles and pragmatics for future practice (2nd ed.). Mahwah, NJ: Lawrence Erlbaum. Northhouse, P. G. (2001). Leadership theory and practice (2nd ed.). Thousand Oaks,CA: Sage. Telltale Games. (2014). The Wolf Among Us. Xbox 360: Telltale Games. Ubisoft Montpellier. (2011, July 27). From Dust. Xbox 360: Ubisoft. Zipper Interactive. (1999). Mechwarrior 3. PC: Microprose. This entry was posted in Criticism, Gaines Hubbell and tagged Blogs of the Round Table, BoRT, constitutive rhetoric, criticism, leadership, rhetoric, teaching, videogames. Bookmark the permalink.